Kate Schultz, MSN, NP-C, is a certified Nurse Practitioner. She is a recent graduate of Boston College with a focus on Adult-Gerontology Primary Care. Kate previously attended Boston College for her undergraduate degree and subsequently worked at Massachusetts’ General Hospital from 2013-2016. There she was a clinical research assistant in the Cancer Center working on clinical trials and published research relating to non-small cell lung cancer. While there, she worked with many amazing nurse practitioners and realized her calling. The nursing model incorporates holistic care of the person with high quality, evidence-based care. She returned to Boston College, in their MSN program, where she worked to become an RN and completed her degree as an NP. Her clinical interests include oncology, palliative care, and women’s health. 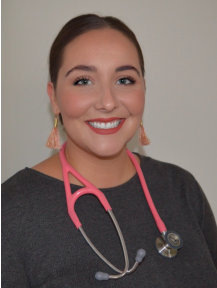 She has worked in various practices including Brigham and Women’s Faulkner Hospital, VA Hospital in Jamaica Plain, and the Boston College Student Health Center. She looks forward to providing all patients with comprehensive, high-quality care following Dr. Tishler’s holistic approach through Cannabis therapeutics. Outside of nursing, Kate loves to paint in acrylics and oils, she volunteers to help adopt rescued animals through Broken Tail Rescue, and is currently working as a registered nurse for Somerville Public Schools as a camp nurse.